I’ve just received an email from BidVertiser promoting their advertising campaign for eBay sellers. They are offering $20 in free funds with no obligation, to use it on this campaign. It is suppose to expose your eBay auction items by placing an ad on BidVertiser network of relevant publisher websites to drive buyers and increase sales. If you are one of the frequent eBay sellers, you probably already know that this month eBay is having Free Listings Promo …. 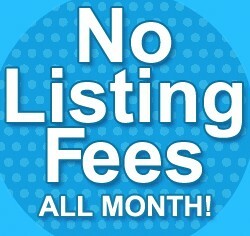 which means no listing fees the whole of this month. If you do not know about this, it is still not too late to create your free auction listing at eBay. With BidVertiser’s free $20 and eBay free listing… you are going to increase sales with no money spent.